I’m sure that just about everybody has heard that expression at least once in their life, though if you’ve lived in any kind of a rural part of the United States you’ve probably heard it significantly more. It also probably has more significance to you if you know how big an actual broadside of a barn is so that you can apply it to the proverbial one. Well, I lived in southern Indiana for several years and there I remember encountering ACTUAL barns. They’re big. They hold all sorts of animals and farm equipment so they built them big enough to house the things that the farm needs to operate. So you can imagine the the broadside (or the longer outer wall) of a barn must be pretty big. The point of this saying is that if you’re shooting a gun, or throwing a ball, or whatever test of accuracy you’re performing, it’s pretty much impossible to miss if you’re shooting or throwing at that. That being said, I lived in a city called Bloomington. If you’re not familiar with Indiana’s geography, Bloomington is the liberal oasis in the midst of the corn fields and limestone quarries of southern Indiana. It was so liberal in the public school system that I had to pass a class on tolerance (which I might note did not adequate define tolerance which is part of what has led to much misunderstanding between the Church and the world IMO) in order to graduate from High School. It was in middle school that I remember really hearing the evolutionist/creationist rhetoric. For the most part in writing on this blog I’ve not really touched on some of the obvious debates that are ever circulating between Christians and non-Christians. Partly because there are enough authors, bloggers, talking heads, and individuals talking about them that I just haven’t seen the point in just adding to the noise. 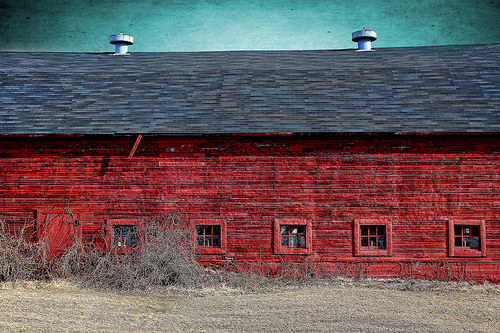 But I was thinking about it today the barn analogy came to mind. I wasn’t a Christian in middle or high school. If someone asked I might identify myself as such, but I didn’t know/love/serve/believe Jesus or the Bible, but even then I remember thinking that the evolutionary worldview was a bit silly. I just didn’t see how it added up the way the teachers said it did and, as a non-believer, I was bothered by the fact that it reduced the value of human life to that of or (to many groups of people) less than that of an animal. You see, even as a non-Christian I believed in the value of human life which is why I loved to eat bacon cheeseburgers and not people cheeseburgers (feel free to deduct 10 points for that horrible joke). If you were to ask me why I believe that God created the universe the obvious answer would be, “The Scriptures tell me He did.” Now there’s a lot more to that but most people nowadays expect something more than that. In fact if that’s the answer you gave you can be expected to be jeered and mocked for your “outdated” and “primitive” beliefs. But all of creation is like the broadside of the barn, and our thoughts, ideas, and theories are like the bullets. It’s in your face and you really shouldn’t be able to miss it. To the anti-creationist it’s foolishness to deny the discoveries of science, but the Bible reminds us that the foolishness of God is wiser than the wisest wisdom of mankind (1 Corinthians 1:18-25). But instead of going through the typical apologetic and scientific arguments I think we’d be better served to consider a different outlook on the matter. How do you view God? Did God create the universe? Is god a part of the universe? Is god an invention of primitive cultures who didn’t know what we know now? Many of the arguments I’ve heard, not just regarding evolution/creation, come back to the matter of worship. Who and what we worship are in integral part of our existence. It’s not just something that “religious people” do. For example, I live in Columbia, South Carolina; home of the University of South Carolina Gamecocks. This city is absolutely overflowing with devout Gamecocks worshipers who plan trips to the stadium every Saturday during football season to barbecue (think of burnt offerings), drink beer (think drink offerings), dress up in matching colors (think priestly garments), and cheer the team on to victory (think prayers and chants). All of these, can be, acts of worship. That being said, we can also worship our possessions (technology, vehicles, toys, games, movies, etc), our ideologies, our scientific discoveries. This is all idolatry. It’s taking our worship and applying it to anything other an the God of the Bible. Here’s the point friends: God’s in charge, not us. We need to stop thinking so much of ourselves and our understanding of things. Ultimately, he’s the one who reveals things to us through either general or special revelations. We speculate about the origins of the planet and life on it but God would tell us as he tells Job, “Stop obscuring my plans with stupid ideas and empty words.” If God was small enough for us to fully understand his ways, we would not love him or want to serve him. So before we enter into these kinds of debates and discussions (which are not bad to have) we need to remember our place in creation and that we really don’t have all of the answers but God does. And also consider the reason for the discussion to begin with. As Christians we have our mandate, to love God, love others, and tell the world of the Good News of Jesus Christ. Note that that list does not include winning arguments. Only faithfulness is needed. Ah, very nice. Was it by J.B. Phillips by chance? I recently picked it up from my church’s library but haven’t had a chance to read it… great title though. I’m glad you liked the post!